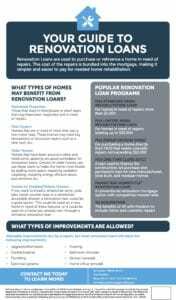 Renovation Loans are used to purchase or refinance a home in need of repairs. The cost of the repairs is bundled into the mortgage, making it simpler and easier to pay for needed home rehabilitation. WHAT TYPES OF HOMES MAY BENEFIT FROM RENOVATION LOANS? Those that were in foreclosure or short sales that may have been neglected and in need of repairs. Homes that are in need of more than just a few minor fixes. These homes may need big renovations or structural repairs such as a new roof, etc. Homes that have been around a while a need some updating are good candidates for renovation loans. Owners of older homes can use these loans to make the home more livable by adding more space. Replacing outdated carpeting, installing energy efficient doors and windows, etc. If you want to install a wheelchair ramp, grab bars, lower counter tops or a wheelchair accessible shower, a renovation loan could be a good option. This could be used on a new home in need of these features, or it could be used on a home you already own through a refinance renovation loan. For homes in need of repairs more than $5,000. For homes in need of repairs totaling up to $35,000. For purchasing a home directly from HUD that needs cosmetic repairs not exceeding $10,000. A loan used to finance the construction, lot purchase and permanent loan for new manufactured, stick-built, and modular homes. A conventional renovation mortgage option with competitive interest rates. The benefits of VA with the freedom to include minor and cosmetic repairs. WHAT TYPES OF IMPROVEMENTS ARE ALLOWED?